The day started out full of promise. No classes, no grading, no meetings. A day at home that could begin with a sketch. Nothing too ambitious, just something to get me back into painting again. But it didn’t go as well as anticipated. I started and restarted and then started again. Changing subjects, changing tools, changing palettes. It just wasn’t working out for me, and I couldn’t figure out why. And then it came to me. It was all about pace. Working life has one pace for me — fast. But the pace for painting and drawing and looking is different. It’s much slower. And it’s sometimes hard to transition between the two. To slow down enough to draw carefully, to think about what you are doing, and to really look at things. But I was persistent. 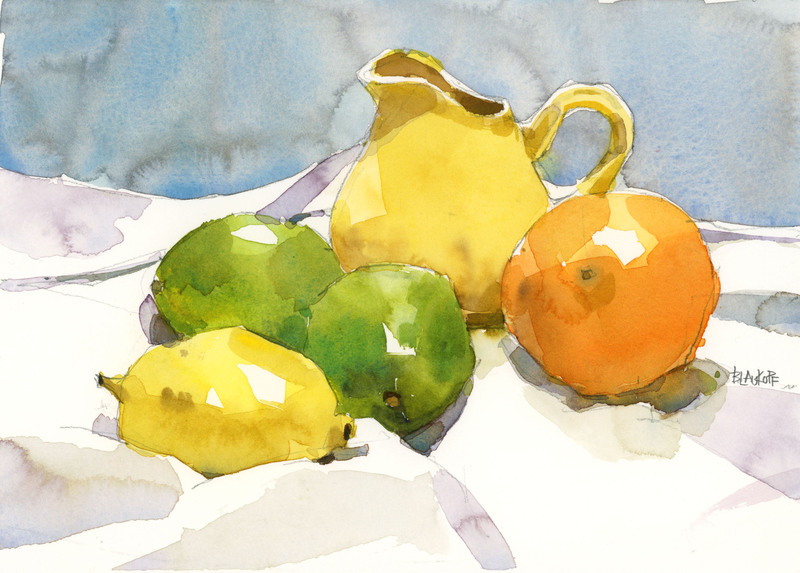 I slogged through the duds, and in the end it was my lemon lime still life that saved my day. There’s an excellent message in here–along with a lovely and delicious looking painting. Thanks so much Vicky. I always wonder if I should write about the bad painting days, but I think guess those are just as important as the good ones. On a envie de croquer dans ces fruits! I wish you a really good and peaceful holliday Shari. Merci Louise! I wish you a wonderful holiday season too, and all the best for the new year. This is beautiful, and very inspiring! It would save my decades! Hi Shari — I am so with you on painting and repainting and not getting it right on the first try… this has been my constant companion in the past few months -) I am also looking forward to painting more, once all of my grading is done. Good for you as I like the message that lies behind your post too… never lose faith! Beautiful painting and have a wonderful holiday season Shari. Thanks so much Jane. We can all relate, can’t we? When the grading is done there’s such a sense of relief. But I also feel a bit lost today and don’t know where to begin with my painting. That is why I had so much angst today. I hope your grading is over soon and I hope you have a wonderful holiday too. this is beautiful….love the sense of light and freshness this painting exudes. Thanks for writing Amrita. I appreciate it. Just signed up for your second class on craftsy. Sincen it is snowing today I will get the time to start it. love your lemons and limes,. That would be a good day make that year for me. Happy holidays to you. Thanks for writing Sharon. I hope you enjoy the class. If it was snowing here I would be outside painting, but we have only had clouds and rain. It’s a very weird start to the winter. Happy holidays! It’s gorgeous, Shari – colours, compostition, and background. This is so lovely and filled with light. I think sometimes it is hard to make the transition between work and non-work time. When you ease into it you are better off. Well this was definitely my easing into it day. Except that it wasn’t so easy! Teacher. Thank you for the reminder to slow down and work through. Combattre la frénésie par la bonne attitude. Un approche zen, un abandon au sujet, et voilà une oeuvre inspirante et lumineuse. Merci Richard, pour une bonne déscription de ce qu’il faut avoir: un approche zen et un abandon au sujet. Hi Shari. Wonderfully simple and clean work. It doesn’t get any better than this. Thanks Russell. It’s nice to hear from you! So lovely. And a change of pace for you I thought when I saw it. In more ways than one it seems. Hi Shari, I know EXACTLY what you mean! And your comment was so apt. This is my last day of running my own business this year and it has been crazy hectic. Tomorrow I start 3 weeks of holiday -first time in years – and I plan to sketch every day. But I have had to leave it for a long time so I know there will be a big transition time back into the ‘zone’. But your beautiful lemon limes was worth the struggle! Right now I am taking the travel sketching course on Craftsy with Marc T H, but then I am going to take your landscape one. By the way, I really like the paint box/pallette I see you with on a lot of videos. Could you tell me the brand so I can get one? Have a great sketching holiday! How wonderful to hear from someone all the way in Kenya. That’s vey exciting for me. Congratulations on your long holiday. It sounds like you’ll be spending it exactly like I would by sketching every day. Glad to hear that you’re enjoying the Craftsy courses too. As for my palette, the one I use is an Alvin Heritage Palette. It has 18 wells for paint, and it has a rubber seal around it so the colours stay fresh. I wish you a quick journey to the “zone” and many happy days of sketching during your holidays! This is beautiful, love how you painted the cloth – that´s really hard, I think. Beautiful colors too!!! I wanted to come back to this post because I thought it is so important. I have the same struggle you describe, Shari. There are so many things I have to do on my mind all the time that making the mental shift required to totally focus on something creative becomes a challenge. Some days are not as much of a challenge, while others present what you describe. Even when I block time, interruptions happen and become disruptive distractions. It requires almost a meditative ritual of centering oneself to achieve focus and direction again. Sometimes that means working through results that are not so good before reaching those that are more rewarding. Persistence and commitment no matter what. Yes. Thanks for writing Louise. This post seems to have struck a chord with many. and well worth the effort! Do you hear that crashing, breaking sound? That is the sound of my illusions being shattered… I thought you did great work all the time… every time! What’s this business about throwing stuff away and re-starting? I think I did hear that sound Ross. All the way from Australia. Even after all this time there are more failures than successes. I guess that will never change. Sigh.